Biglerville's Ben Hurda took fifth in the AA boys javelin and Spring Grove's Nathalie Elliott took sixth in AAA girls pole vault. SHIPPENSBURG - Spring Grove junior Nathalie Elliott has become accustomed to being an underdog, but she knows those days are over. 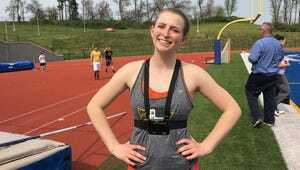 A PIAA medal does a lot to change the way competitors view each other, and she earned a sixth-place medal in the Class AAA pole vault early Friday afternoon. She cleared 12 feet for the second week in a row to match her personal best. Her first trip to the state meet offered some new challenges, as she performed in front of a larger crowd and battled temperatures in the mid-80s while sometimes waiting as much as an hour between turns. York County Tech senior Lauren Corbitt cleared 11-6, just missing the medal stand in ninth place. Both girls previously qualified for the USA Track & Field Junior Outdoor Championships, set for June 24-26 in Greensboro, N.C.
Red Lion junior Greg Potter, who didn't place at last year's YAIAA championships, left his first state meet with a sixth-place medal. That turnaround might be a surprise to many, but VaultWorx coach Matt Concannon saw it coming the whole way. “I was trying not to be too excited with him and overwhelm him, but I knew he could be really good," Concannon said. "I knew right away he could jump 15 feet. I don’t know if I expected it a year later, but certainly you could see it. Potter leaped 14-9, narrowly missing attempts at 15-3, which would have set a new personal record. His current personal record, set at the Penn Relays, is 15 feet. He will also compete at the USA Track & Field Junior Outdoor Championships next month. Biglerville senior Ben Hurda ended an accomplished high school sports career with a first. Hurda, the quarterback of the Canners' division-title-winning football team last spring, placed fifth in the Class AA javelin with a throw of 181-7. Hurda's personal record this season was 186, but he threw in the low 180s four times Friday. But the disappointment of not setting a new personal record couldn't damper the thrill of earning his first state medal. “It’s a good way to go out,” Hurda said. 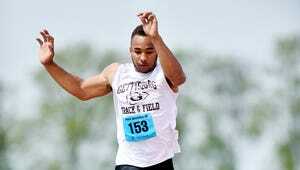 The Dallastown boys' 400 relay accomplished two more goals during Friday's preliminary round. The Wildcats broke the school record — which they set two weeks ago at the YAIAA championships — with a time of 42.27 seconds. The time won their heat and assured them of accomplishing their season-long goal of earning a state medal. The Wildcats will be seeded seventh in Saturday's final, when they hope to break the record again and run less than 42 seconds. South Western senior Lynne Mooradian ran the 300 hurdles in 43.64, winning her heat with the second-best time of all competitors. Her legs will get some extra rest since she did not have to run her other event, the 1,600 relay. The AAA girls, AA boys and AAA boys preliminaries in that event were cut from Friday's schedule because of approaching storms. Instead, they will be run as times finals Saturday.